WebRTC has many moving parts in it. When WebRTC works it seems like magic. You point your browser to a URL. Get someone else to point his browser to a URL – and – you now see each other. If you look below the hood, there’s a lot going on in there. Looking for a WebRTC course to dig deeper and build a solid architecture for your product? I’ll try to give the explanation of how WebRTC works in a few different angles here. Together, they should create a pretty good picture of what’s going on. 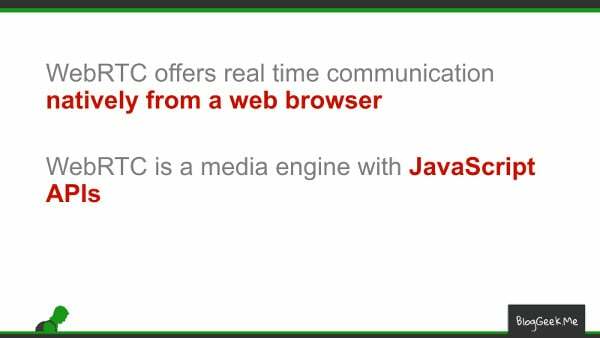 WebRTC is the means to drive real time communications (voice, video and arbitrary data) directly inside a web browser. No need for any plugin or download to do that. Somehow, that’s not saying much. So let’s start with what makes WebRTC truly unique from a browser perspective. You have the browser as a client. It connects to the server to ask for stuff. Lets call these things requests. And the server obliged by sending responses. We’ve grown beyond that using WebSockets, but it still is rather the same. If I want to send a message to a friend who is looking at his own browser just now, the message needs to go to the server and from there to my friend. Much like the post office works. While we still need to somehow signal from one browser to the other so we will be able to locate each other, once that signaling is over, we can send them messages directly between the two browsers – without the web server ever touching the messages. Magic. This is why many refer to WebRTC as a peer-to-peer technology. Or P2P in short. Because browsers can communicate directly. It ends up being a mixture of static stuff and a bit of code to hold it all together. It requires two types of interactions that go over the network. Signaling and media. 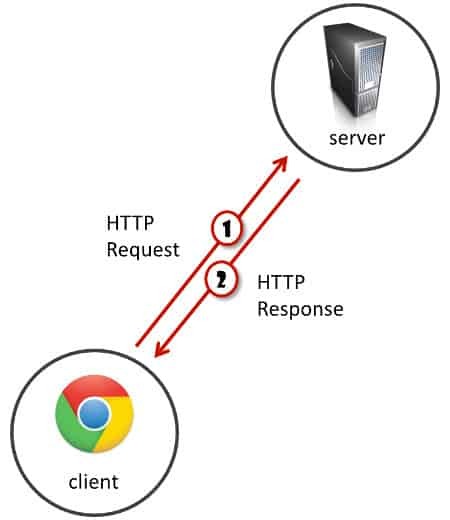 Signaling takes place over an HTTPS connection or a websocket. It is implemented via JS code. What you do in signaling is decide how the users are going to find each other and start a conversation. One important thing about signaling – it isn’t part of WebRTC itself. The developer is left to decide how to pass the information needed to create a WebRTC session. WebRTC will generate the bits of information it needs to send and process such bits of information that gets received but it won’t really do anything over the network about them. These bits of information are packed into SDP messages by WebRTC today. The actual media goes off on a very different medium and connection. It goes through “media channels”. These use either SRTP (for voice and video) or SCTP (for the data channel). Media takes a different route than signaling over the network and behaves very differently. This is true for the browser, the network AND the servers you need to make it work. Audio and video is the main thing you’ll notice with WebRTC. It is also what gets showcased in almost all demos and examples of WebRTC. The reason for that is simple – video is VERY visual and interactive. Audio and video in WebRTC works by using codecs. These are known algorithms that are used to compress and decompress audio and video data. There are different codecs you can use in WebRTC and I won’t get into it now. Audio and video also gets interesting because it is sent with low latency in mind. If packets get lost along the way due to network issues – it might not be worth retransmitting them (another first in the HTML). WebRTC uses known VoIP techniques to get media processed and sent through the network, and this is all done over SRTP – the secure and encrypted version of RTP. WebRTC did make some minor changes by using specific mechanisms in SRTP that were not in wide use before, making it a bit harder to interoperate with if you have a VoIP service deployed already. You can also send arbitrary data with WebRTC. This is done over what’s called the data channel in WebRTC. The data channel can be used when what you want to do is send direct messages between browsers without going through any server (you may still need to relay it through a TURN server though). Being able to communicate directly across browsers is great, but it doesn’t always work. The internet was built on the client-server paradigm some 30-40 years ago. Since then it has changed somewhat. Today, most users access the internet from behind a firewall or a NAT. 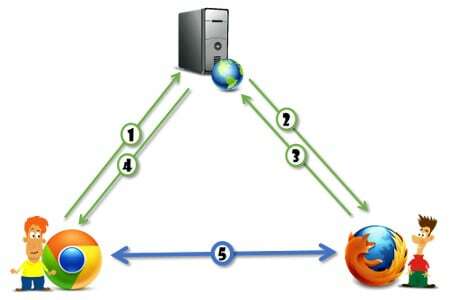 These devices usually change the IP address of the user’s device and mask it from the open web. This masking can be just that, or it can also offer some measure of “protection” where unsolicited traffic is not allowed towards the user’s device. The problem with this approach, is that WebRTC uses different mediums for signaling and media so understanding what’s solicited and what’s unsolicited traffic isn’t easy. Furthermore, there are enterprises who make it a point not to let any type of traffic into (or out of) their network without vetting it. The guy there on the left? He now might actually know the public IP address of the guy on the right due to that STUN request that was made. But the public IP address might only be opened to the STUN server and having anyone else try to connect through that “pinhole” that was created may still fail. 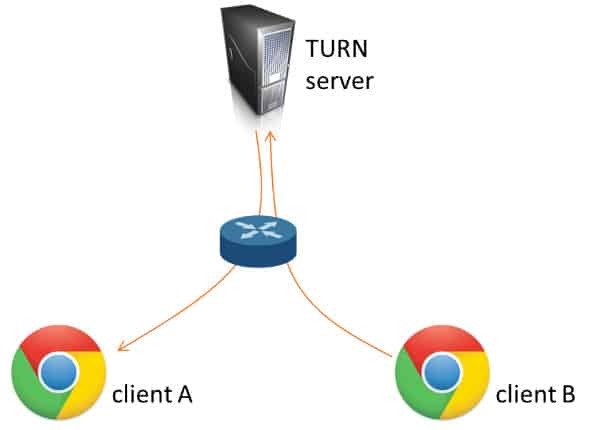 You can expect anywhere between 5-20% of your sessions to require the use of TURN servers. Oftentimes, developers won’t develop directly against the WebRTC APIs and will use third party frameworks and modules to do that for them – open source or commercial. getUserMedia is in charge of giving the user access to the camera, microphone and screen. It alone gives value for those who need to do things locally, without implementing real time conversations. I am sure you can come up with more uses to it. PeerConnection is at the heart of WebRTC and the most complex to implement and to understand. In a way, it does EVERYTHING. It handles all the SDP message exchange (not sending them through the network itself, but generating them and processing the incoming ones). Much of what goes on inside peer connection that affects the resulting media quality is based on heuristics. A specific set of arbitrary rules. Different implementations may have different behaviors and different media quality due to this. I’ve discussed the data channel somewhat earlier. Data channels were designed to work on the API level similar to WebSocket, so once you open it, you can think about it in a similar fashion. You can find a few ideas of what people are doing with data channels here. There are more ways you can make use of it. Before you continue, you may want to check out this article about programming languages in WebRTC. The client side can be a browser, mobile application, PC application or an embedded device. For mobile applications, this is mostly about finding an SDK you’re comfortable with. There are again a few available on github, along with the official ones coming from Google for iOS and Android. There are also some commercial mobile SDK out there that are pretty good. You can go for a PC application. Most do it by using Electron. And there’s also the embedded approach, which means either taking the official Google WebRTC codebase and porting it to whatever device you have or developing something on your own – I’ve seen both approaches work. You will need a signaling server. The first thing a WebRTC client will do is call the mothership. That is used to coordinate whatever session you have in mind for it. The signaling server isn’t in the scope of the WebRTC specification so it is up to you to figure out what to use here. Most of the code you’ll find in the github for the browser client is actually going to be an implementation of a signaling server. Remember that the signaling server can be separate from your web server or they can reside within the same process – up to you. And in any case, the first thing to do is to check if there’s already some kind of a signaling mechanism that you have in place for your application for things that aren’t WebRTC. You might be able to piggyback your SDP messages and other WebRTC related signaling over that mechanism (I know that’s what I’d try to do first). 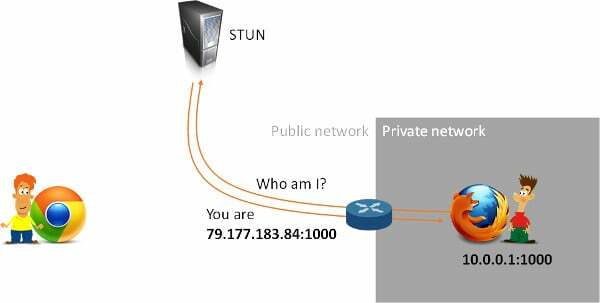 For NAT traversal you will need to deploy STUN/TURN servers. if you are planning on group voice and video sessions, connectivity to PSTN or other networks, recording or other fancy features, then media servers are in your immediate future. Look for something that fits well with your use case. I’d even say start here before picking anything else in your technology stack. There are a few open source and commercial alternatives out there. They are different from one another in many ways. Looking for a WebRTC Training? The purpose of this article is to get you the most basic understanding of WebRTC if you’re a newb. I didn’t want to take the approach of building a “hello world” application – you can find many of these on the internet already. What I wanted to do instead is go somewhat higher and take a look at the bigger picture – you’ll be needing it soon enough. In many cases, people start with a “hello world” implementation of WebRTC and try to fit it to their own scenario. I find that it is the wrong way in many cases, as it all depends on what it is you are trying to build – it will dictate the starting point you’ll need to make in your journey. Spend the time to read this article, and then go read a “hello world” manual or two for WebRTC. It will make it a lot more effective if you do.